A true mycophile like myself listens to mushroom music. Larry Evans has done it again! Music about mushrooms that is mycologically correct and fun to listen to. The cd covers songs about Boletes, Morels and others. There is a song about the Fly Agaric that is funny and thought provoking.The songs describe different identification tips, and the Latin names are taxonomically correct. 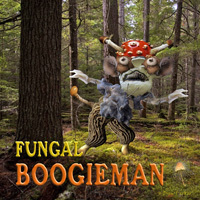 The newest cd out is the Fungal Boogieman. I have not purchased this one yet, but will be soon. In listening to the sample tracks, it sounds like another fun one to have and listen to. The setup and context seems similar to the last one. The link on the homepage will get you to the Fungal Jungal, with some samples of the cds as well as the lyrics to the songs. 10% of the purchase price goes to the WMMA, a worthy cause indeed!The WMMA and Larry maintain the Fungal Jungal website that is loaded with mushroom information and links. So get yourself some mushroom music and learn more about mycology while you are at it! The morel hunters are coming. Your source for information about Mushrooms in Montana.